W00066279.jpg was taken on January 11, 2011 and received on Earth January 12, 2011. The camera was pointing toward RHEA at approximately 59,938 kilometers away, and the image was taken using the CL1 and CL2 filters. 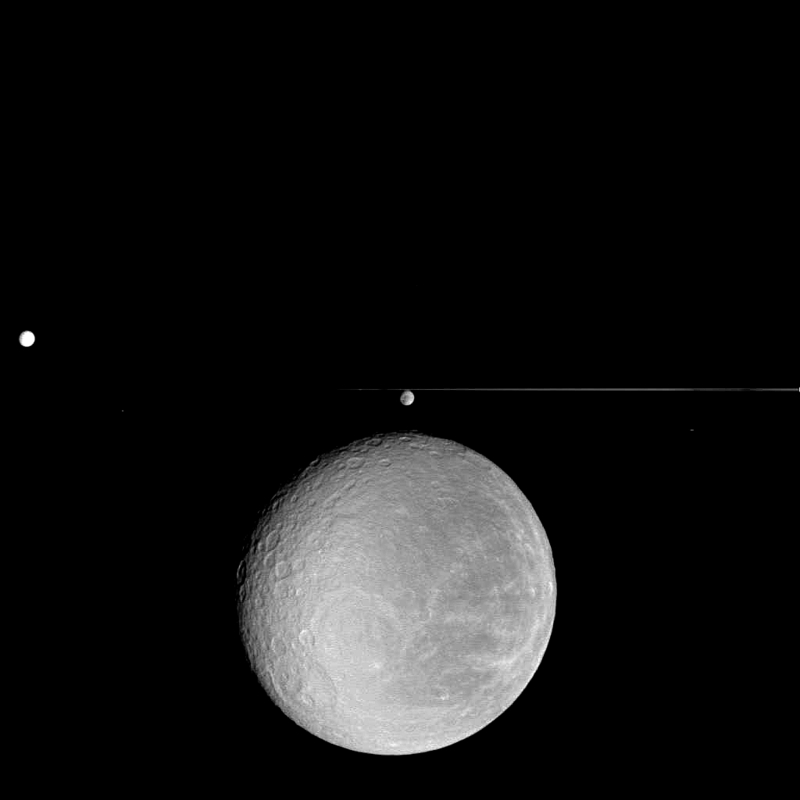 Sister moons are seen above and to the left of Rhea; the bright line is an edge-on view of Saturn's ring system. This image has not been validated or calibrated. Image Credit: NASA/JPL/Space Science Institute. Levels, contrast, and brightness adjusted by James Guilford. It seamed like it might be fun to toy around with brand-new raw images just received from the Cassini spacecraft in orbit around Saturn. I must say I didn’t do much with the image. Still, it was fun to see details emerging from a formerly soft, gray picture as I made adjustments to the image. I’m away from my home office so I used GIMP instead of Photoshop but I’m sure to play with pictures like this more often in future!